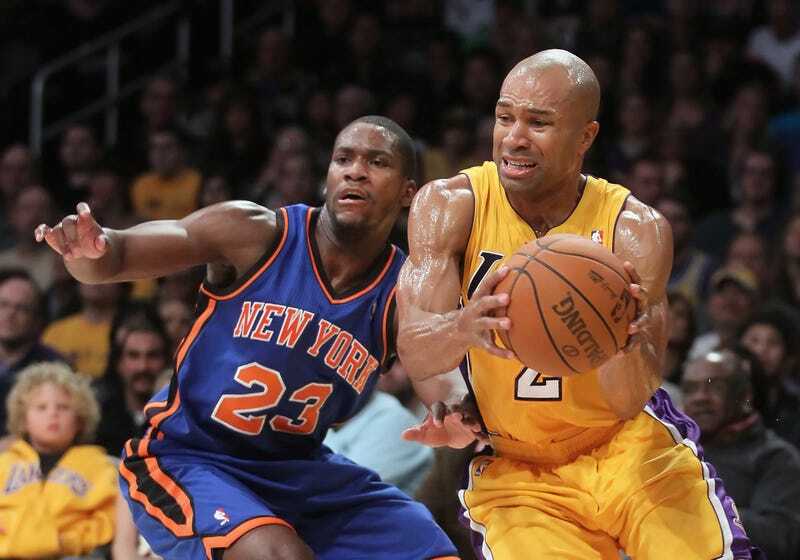 Bleacher Report's Howard Beck is reporting that human bicep curl Derek Fisher will be the next coach to be fired by the New York Knicks. Fisher, who was part of a group of former Lakers to be considered for the job and at best second-choice, will reportedly bring on Kurt Rambis, and possibly his other competitors, including Rick Fox, Luke Walton, and Bill Cartwright, because what the hell, we're all friends here. Last week, Phil Jackson was fined $25,000 for tampering with Fisher, who was at the time a free agent for the Thunder and shares many characterizing mannerisms with a plate of steamed cauliflower. Fisher played 17 years, 10 under Jackson, and served as the president of the NBPA until last year, when he was part of a group of players to force out Billy Hunter. The five-time champion seems like he would be really hard to be friends with. For the Knicks, the first-time head coach will be their ninth in 10 years, which has apparently not dissuaded the franchise to being close to finalizing a 5-year, $25 million contract, which the team will continue to pay after Fisher's imminent firing.